Tea is strong (especially at 5 minutes), makes people happy, is a unifier and has been at the center of many major events throughout history. Remember: The Boston Tea Party became one of the primary catalysts for the American Revolution that led to the independence and subsequent creation of the United States. How absolutely fabulous would it be for TeaPeeps like me, and the world in general, if our hopeful New President were to enjoy a cuppa tea at a Press Conference? With Republicans. Or, perhaps while he reviews how he is going to bail us out and reform Healthcare. I would be overwhelmed with joy to know that he wasn’t making important decisions on Red Bull. Tea is here to stay. And, all things are possible over a simple cup of tea. Like… World Peace. 0% unemployment. And Climate Control. Am I reaching? Maybe a little, but remember, I was trained by Ad people. “Tea or coffee? It must be the former, because everyone I know is trying to read his tea leaves, especially when it comes to energy and environment policy. Crystal balls and beverage dregs may be reliable methods of forecasting some things in our future, but when it comes to sustainability (and that’s really what you mean when you say “energy/environment” or “climate” policy) look to California for a hint of where to focus your personal or corporate viewpoint in the coming months. Here are three big areas where the Golden State is leading and, I believe, the Obama Administration will gladly follow. The second California sustainability trailblazing that we should watch is in what’s called “green chemistry”. Governor Schwarzenegger set policies and signed laws that require a growing number of manufacturers to formulate products, from bug spray to baby bottles, with non-toxic ingredients and chemicals. Given the anti-science approach taken by the Bush administration on environmental and public health issues, look for the new President to rapidly order his bureaucracy to build on the sound science and smart policy of states like California on a host of these programs that make us healthier. Last, take a look at energy efficiency. Californians are 40% more energy efficient than average Americans and it’s not because we don’t enjoy watching the SuperBowl on a 72″ Hummer of a TV. It’s because of state energy efficiency standards for appliances and buildings that save people lots of money, along with regulatory policy that incentivizes utilities to invest in energy efficiency programs for consumers. Watch for the feds to do a quick cut-and-paste. And now I will segue from Terry Tamminen’s article into…. Try our Drink for Change Blend. It’s delicious! With only 3 days left until the new year, I have to admit, I can’t wait to say goodbye to 2008. Out with the old and in with the new. I have high hopes for 2009. So much tea to taste. Blends to create. Gardens to visit. People to spend time with over afternoon tea. And… more time to spend nurturing my little tea company, Pearl Fine Teas, that is slowly, but surely, making its way into the hearts of many. So, rather than talk about how we should usher the New Year in with a nice traditional cuppa, I’ve decided to share with all of you one of the most fabulous cups of “tea” I’ve had in the last year. Namely the GREEN TEA MARTINI! Think about it… It’s the perfect combination of fun and antioxidant. What better way to say “Happy New Year” than with one of these in your hand. I can tell you from experience that this baby goes down smooth, so take it slow. And choose a designated driver. 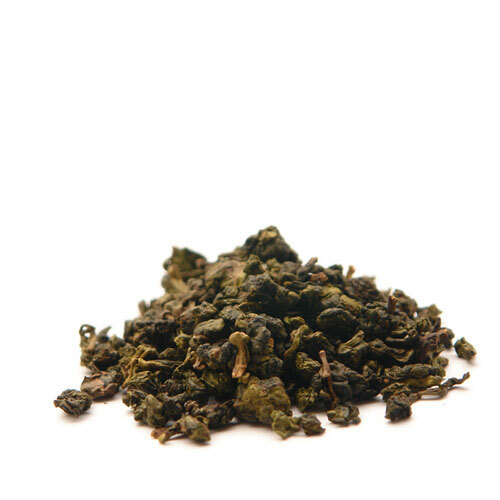 • Steep loose leaf green tea, but not too long so it doesn’t become bitter. Cool off and add some honey to sweeten lightly. • Combine tea, vodka and Grand Marnier in a martini shaker with ice and shake until chilled. • Garnish with lime or orange slices. *If you liked this post, please share with a friend! I click on my Google Alert and scan, and scan, all the way down to Blogs. And I’m reading, and reading and I notice this article on Presidential Teas and I think, “Wow, someone else came up with the idea too? 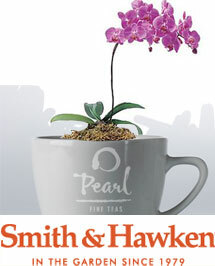 How odd.” Then I realized I was reading about my very own little tea company: Pearl Fine Teas. Tea Guy Speaks posted a lovely bit about us on his fabulous blog and rather than thank him via comment to the post, I decided to thank you in a more grand way: by blogging right back. Many of you probably already know about his blog and how amazing the info is about the tea world. I often look to it for things I wouldn’t ordinarily find. Like the fact that there was a Tea Drinking Gorilla who recently passed away at age 48 or that World Tea News wrote about us and I didn’t even know it. 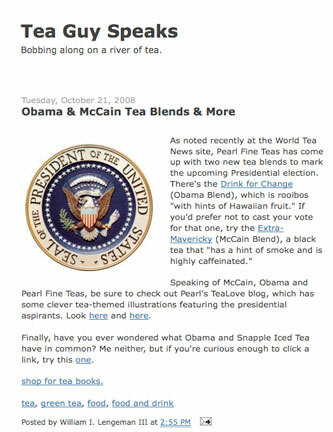 You can read the bit called: “Politics Inspires Tea Blends“ on their site. When I posed the question on Twitter a few weeks ago, I had no idea people would be so interested. Seems its spreading like wild fire. It’s looking like California is taking the lead with blend orders. Thank you TeaPeeps of California! And thank you Tea Guy Speaks for the nod. Remember to Vote. And drink tea.